Amazon announced a bunch of products, which means it registered a bunch of domains controlled by Verisign. New Amazon Alexa devices like the Echo Spot lead to defensive domain registrations. Every time Amazon announces a new product its domain name team goes to work defensively registering domain names. So when the company announces six products on the same day it goes into overtime. 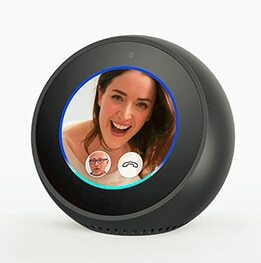 Amazon announced six new Amazon-Alexa powered devices yesterday including the new Echo, Echo Plus, Echo Spot, FireTV with Alexa remote, Echo Connect and Echo buttons. You can learn more about these devices in this week’s Internet of Things Podcast. The company registered hundreds of domain names related to the new products. Some are specific to the individual products (AmazonEchoButton.com, AmazonEchoSpots.com, EchoPlusGuide.com) and others related to Echo Gadgets (AlexaGadgetAPI.com, GadgetsAPI.com). Two companies win whenever Amazon registers these domains: Amazon’s brand protection registrar MarkMonitor and Verisign (NASDAQ: VRSN), which runs .com and .net. DomainTools shows that Amazon owns about 45,000 domains that are tied to hostmaster@amazon.com, and there are likely more registered under different names.